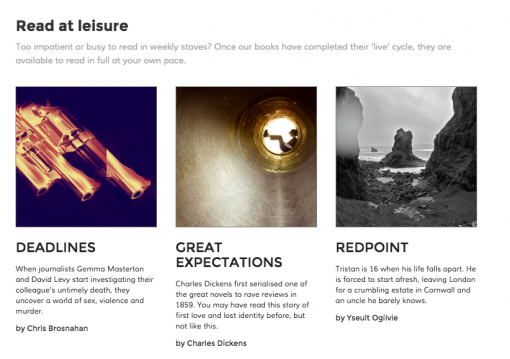 Pigeonhole, a young, digital-only publisher in the UK, is commissioning new fiction, refashioning classics, and offering their ebooks via serialization and subscription. Anna Jean Hughes and Jacob Cockcroft founded The Pigeonhole in the UK in 2014 to “transform the way in which readers and writers interact with literature.” The digital publishing company publishes literary fiction, genre fiction, as well as narrative non-fiction, whereby subscribers can purchase each book chapter by chapter, serially online, at a cost of 50p per chapter. Books can be read online, on Kindle or via an app Apple iOS. Publishing Perspectives spoke to them about their journey thus far. 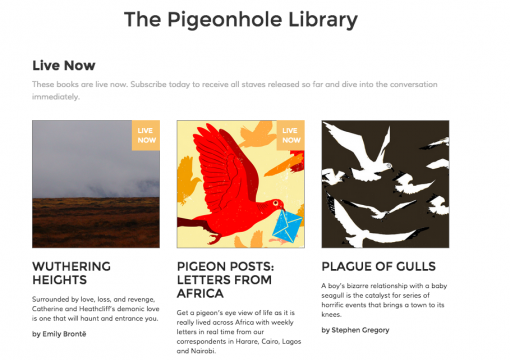 Tell us how the idea for the Pigeonhole came about. Jacob: The Pigeonhole was born out of the simple desire to make launching books exciting again. We listened to one too many writer friends lament the state of the publishing industry and, most importantly, the collapse in their income from book sales, and decided we could do something about this. Publishing a book should be exciting, and the digital world opens up so many amazing possibilities. We could see a path to do something really special and we knew our mission had been born. Anna: For me the first inklings came in the cab of a white van as it bombed its way down the A303. I was with my Dad and moaning yet again about the publishing industry; about the ever-shrinking book columns in the press, the silly dependence still metered on hardbacks, about the nepotism and short-sightedness, about its terrible financial rewards for the writers and employees alike. I couldn’t understand why it was that nothing had really changed for decades, despite great leaps in the digital market. I still know publishers today who dismiss ebooks as some sort of witchery. On that drive we constructed the barebones of a company that used a digital launch to test the market and drive readership. It was to be for all the books that didn’t fit into a pigeonhole, books of every genre and vision. It wasn’t until I met Jacob that things got really exciting and he came up with the idea of serializing our titles and there we built the multi-talented little bird you see today. Jacob: We have developed a unique micro-pricing model where our readers pay per stave and as such can decide to stop reading at any time. The idea is to encourage people to try books they would not otherwise read, whilst also making it very affordable for readers around the world. In the longer term, we are already starting to talk to various literary agencies and publishing houses who are interested in partnership arrangements where they can utilize the platform and digital book club framework for their own books. There is a large multi-media aspect to the site where, in addition to subscribers receiving a new chapter each week digitally, there are also interviews, videos, and other interesting interactive tidbits for the reader. Tell us why you decided to add this dimension to the process? Jacob: There were two factors at play here. We wanted to provide people with a way to get behind the scenes of the book, to meet the author, to delve into the underlying themes, and to just get that bit closer to the creative process. The various multi-media channels are perfect for this, and highlight one of the great strengths of digital publishing. It also gives us the opportunity to work with other creative people, and help them showcase their work. The illustrators of our beautiful book pages are a great example of this. Anna: One of the other aspects we were excited about when laying out the foundations was to offer a platform from which to launch new voices, not just authors, but also those who could help tell the story behind each of our books – DJs, illustrators, film makers, sound technicians and academics – all have another take on the work we publish, offering something extraordinary for both reader and writer. Also, the world is such a busy place, we are under constant bombardment, there’s just so much information out there. As such we are no longer simply in competition with Penguin, or Amazon and iBooks, but everyone who might plug your leisure time, so we wanted to be sure to we had lots of things to keep you entertained. Anna, you are veteran of the publishing industry, having worked at Random House and also at the Peter Fraser & Dunlop literary agency; Jacob, you are a lifelong book addict and have a corporate background. Can you tell us how your backgrounds have prepared you for this role? Jacob: Our totally different backgrounds are our greatest strength. My experience of running complex global projects in the corporate intelligence world is the perfect compliment to Anna’s publishing experience. It means that we have pretty much all bases covered between us, with obviously a shared passion for books as our common bond. Anna: After a decade watching publishers struggle to make their ends meet I now feel my loyalties lie squarely with the writers and their audience. The industry is heaving with the most incredible people, but they are under so much pressure. Corners are cut everywhere and no one has the space to shine. This job is hard, evenings and weekends, every spare moment is spent reading, pitching, planning and editing… It all takes a long long time, and few inside the system are properly rewarded. This goes for the authors too, so many have had their careers ruined by a mis-published book, or they are poorly compensated with crippling advances, unearned royalties and pathetic launch parties. I just wanted to do something about it. Ours is a profession that has evolved without check, one that’s grown through constant and tiny alterations rather than upheaval, but that is all about to change. The joy about working with someone outside of the industry is there is no limit to the scope. What has been some of the challenges so far? Jacob: The greatest challenge has been creating something from nothing. Of having the belief to start with a drawing on a napkin and take this all the way through to building the world’s first truly social reading platform. We are making great strides along this journey, and quite often we have to stop and smile at the audacity of the aim. This just makes us even more determined to succeed. Anna: I’m with J on this one; we’ve created a revolution rather than an evolution, one that challenges most aspects of a very old and established model. You have to feel your way and learn to react quickly. There’s always room for mistakes, but the biggest challenge is to identify, alter and move on as fast as possible. 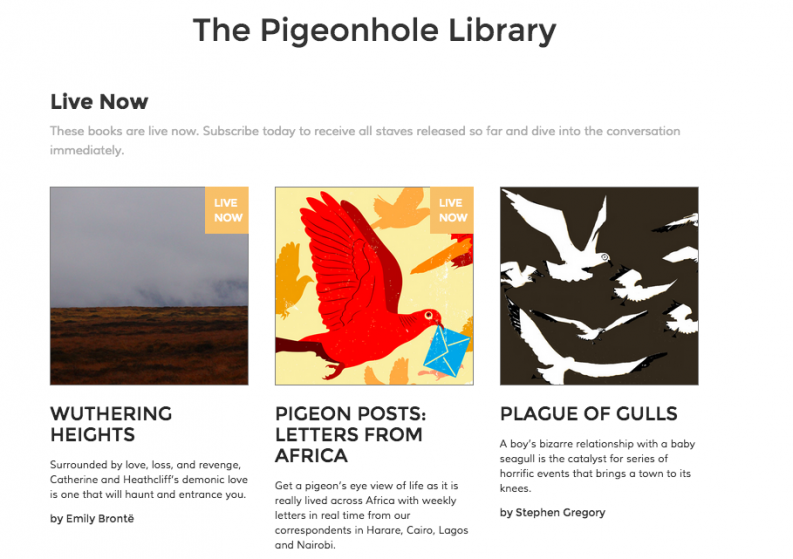 Who is your target audience for the Pigeonhole? Jacob: We are focused on young people who enjoy reading and discussing books, and want this to be a social experience. We have started with large open groups reading together, but will soon also be rolling out the ability for smaller groups to read together at their own pace. This means we are well set to start working with schools too. Anna: Everyone! We look to publish all sorts books and the platform is aimed at all ages and reading abilities. With our new private book clubs, our readers will be able to set their own reading pace and discuss thoughts and themes with a core group. You commission new materials such as the Pigeon Posts: Letters from Africa, as well as publish age-old favorites such as Wuthering Heights? Tell us about that mix. Jacob: Our aim is to have something for everyone. We believe we can achieve this through carefully curating a small number of exceptional books, rather than overwhelming our users with too much content. So we will publish 5-6 books per season, but across a wide range of genres. Anna: There is a lot of dependence on the categorizing of books by genres and there are so many out there that refuse to be boxed up and pigeonholed (ta-da), with is in mind, and also the fact that we want to cater for as many people as possible, we wanted to show everyone just how much breadth we had. Taste is a funny thing, so much impetus is matching reader to book, but it’s pretty meaningless when all you offer are excellent stories told well. The publishing industry has changed so much, what are your thoughts on the future of publishing? Jacob: The future of publishing is really exciting. The digital frontier will transform how many people consume books, but there will always be a place for physical books too. People will just have greater choice. That said, digital will consume the mass market paperback (the economics simply don’t make sense anymore). Smart phones will also kill the Kindle, as the Kindle reading experience is replicated by iOS and Android. Anna: The last couple of years have seen more change for publishing than the past couple of decades preceding it, and there is no sign of it slowing. I think the industry will see continued polarization; the large conglomerates will seek to expand and dominate, but these companies have little identity and more and more brand-association is what garners a dedicated following. So to bridge the gap smaller, more boutique services will arise, offering beautiful books, exciting tech or experiential reading. It’s just nice to be at the forefront of this. Can you tell us about some of the books you’ll be publishing in the near future? Jacob: We’ve got a fantastic line up for 2015, including some amazing chick-lit set in Tel Aviv, sci-fi, horror, and a thriller from a well-known writer. We’re also going to continue our Letters From series, from a secret next location. We’re already planning for 2016 too. Anna: There are such exciting things coming up, we have a cookbook from Charlton Nicholl, Breakfast Serial, a series of work-hacks and an anthology of retold fairy tales coming very soon, as well as a beauty book and some seriously good literary and historical fiction. What are your hopes and dreams for the site? Jacob: We want to be THE social reading platform. It’s not about competing with Oyster and trying to become the Spotify of books, its about creating a sociable reading experience where people can communicate through books, with each other and with the author. We are releasing a brand new version of the platform and app in March, which is stuffed full of exciting new social features – and we just carry on building from there! Anna: I also hope that someday soon The Pigeonhole becomes the place for new authors or experimental works from established authors. I would love to be the go-to publisher for great writing and we are very much on our way there. I am so proud of the writers we have on our sit so far. I just can’t wait to show you what we have coming next, it’s all pretty marvelous. Nana-Ama Kyerematen is the founder of Afridiaspora.com, a webzine dedicated to showcasing and promoting literature from Africa and the diaspora.